You have money available in your OptionLine home equity line of credit1. Now is a great time to put it to use. 1 This product is a variable rate line of credit that is secured by primary residence. This account includes a fixed rate option. This rate may vary, but once established as a new Fixed Rate Advance, will not vary thereafter. A $100 rate lock fee applies each time you establish a Fixed Rate Advance. Borrower must pay mortgage satisfaction fees at loan termination. 2 The advertised promotional 2.29% APR (ANNUAL PERCENTAGE RATE) is only available to intended recipients of this direct mail offer that currently have an existing line of credit. This offer may not be combined with any other offer. This offer may be withdrawn at any time. Your Regular Payment during the Discount Period will equal the amount of your accrued FINANCE CHARGES or $50, whichever is greater. 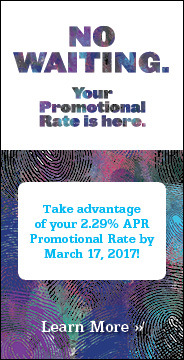 2.29% promotional rate does not apply to any fixed rate balances on your line.